They are the craftsmen on whom the maintenance of some of Europe’s most remarkable buildings relies, and later this month their collective clatter of hammer upon chisel will be heard across York. The first Stone Carving Festival to be held in the city since 2010 will bring together around 70 of the world’s most foremost masons, in a curious content against the clock that could do for cathedrals what Bake-Off has done for buns. 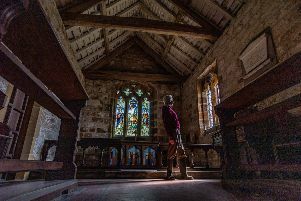 The A4-sized pictures they carve onto stone slabs – along with stonework recycled from York Minster itself – will then be sold in an online auction. “I suppose it does sound like a TV format. I hadn’t considered that,” said Alex McCallion, director of works and precinct at the Minster, where the event will be hosted on the weekend of August 18 and 19. “But it’s going to be a real celebration of heritage and of the people who work on some of the world’s most iconic buildings. The weekend forms part of a four-day celebration of ancient craft at the Minster, which begins with the annual open day at the stoneyard. The masons will spend two days carving animal-themed images, and will then vote on each other’s work to pick a winner. “They will be long days. They will work from 8am to 6pm on the Saturday and from 8am to 3pm on the Sunday, and they have to be finished by three,” Mr McCallion said. The best carving, and the best by an apprentice, will be given prizes, and then sold off. The competition is likely to be stiff, with masons from Canterbury, Durham, Lincoln, Winchester and Norwich Cathedrals and from as far afield as Iceland, India and the vast Romanesque Nidaros Cathedral in southern Norway, where the country’s kings are traditionally crowned. Carving festivals are convened on an ad hoc basis rather than by date, Mr McCallion said. It will also be an opportunity to sell off bits of stonework that have fallen from the Minster or been replaced during previous restorations. In the first such event for two years, they will be auctioned on the Wednesday after the festival, with lots ranging from the 14th to 19th centuries, including include grotesques, finials and 10 lots which form an 18th century pinnacle. “We’ve heard in the past of people using them in walls or as garden features, said Mr McCallion. “In some cases they have been used as tables with a piece of glass on top. The stones will be in Dean’s Park, alongside the Minster, for viewing on the weekend of the festival. Proceeds from the auction will be ploughed back into the cathedral’s maintenance.